Reposted from The Electronic Intifada, By: Asa Winstanley and Ali Abunimah 30 October 2018: An Israeli embassy officer spied on student supporters of Palestinian rights, undercover video released exclusively by The Electronic Intifada shows. 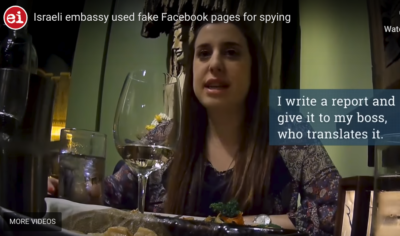 The film indicates that the Israel on Campus Coalition is connected to the anonymous blacklisting site The Canary Missionon behalf of multimillionaire pro-Israel financier and convicted tax evader Adam Millstein. A group of Israeli settlers yesterday raided two Palestinian buildings in Al-Khalil’s Old City, in the south of the occupied West Bank, locking them from the inside. Reporting Al-Khalil’s Rehabilitation Committee, Quds Press said that the homes in the buildings are owned by Palestinian families Arafa, Al-Hamour, Zaheda and Al-Shurbati. The two old houses, the Committee said, are adjacent to the illegal settlement complex of Avraham Avino in the heart of the Old City. Meanwhile, he said that the settlers use equipment from the occupation forces, which Hamdan said is an effort “to enable the settlers to reach the Palestinian buildings”. He noted that the Israeli occupation authorities turn a blind eye to the “illegal” activities of settlers. While Americans and the rest of the world’s attention was focused on the US midterm elections and the mysterious disappearance and murder of Jamal Khashoggi, Israel occupation forces (IOF) and demented illegal Jewish settlers murdered two Palestinians that left 15 orphans and two widows behind. The questions are: Why on earth would Israelis kill Palestinians for fun? Secondly, who were the victims that Western media did not bother to report about or conveniently ignored their horrific death? A Palestinian ambulance rushed her to a local Palestinian hospital. However, the mother of eight children never made it. The settlers returned home safely and no arrest was made. The family said, IOF has killed Aisha’s brother in the past. Second Victim: Mo’amar al-Atrash, 42, was shot ten times execution-style in his back by IOF soldiers in the Occupied West Bank city of Hebron (Al-Khalil). Based on an eyewitness account, the victim at no point posed a threat to the soldiers stationed at a checkpoint near Al-Abrahimi mosque. The soldiers never bother to call for an ambulance so the victim was left on the ground to die. Mo’amar has 7 children all of whom are under the age of 16. The tragic stories of the two Palestinians’ parents I mentioned above were murdered during the month of October. According to If Americans knew, NGO website, the number of Palestinians killed during the month of October 2018 by Israeli soldiers and Jewish settlers is 28. Aisha Rabi and Mo’amar al-Atrash were among the victims. Sadly, the only time the Israelis and the Western news’ media outlets express any outrage or cover such heinous crimes is when the killing is the other way around. Meanwhile, these senseless acts of murder has filled so many lives with sorrow, as it devastates parents, children, siblings, friends and neighbors. If Israel claims it has the most moral army in the world, then why on earth would Israelis kill Palestinians for fun? 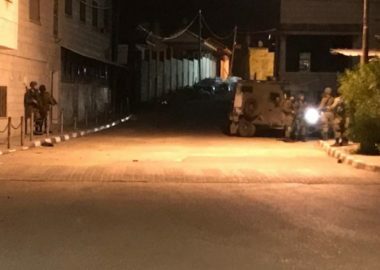 Israeli soldier surrounded, Tuesday, Shweika area, north of Tulkarem, in the northern part of the occupied West Bank, violently searched and ransacked dozens of homes, and buildings, before abducting two young men. The soldiers abducted Majed Zidan Na’alwa and Omran Hosni Abu Ahmad, from their homes, and took them to an unknown destination. The soldiers also invaded and ransacked dozens of homes, after detonating many doors, and interrogated scores of Palestinians while inspecting their ID cards, especially in the areas of Thahrat Ekbariya, Na’alwa and Wadi ash-Sham. It is worth mentioning that the army has significantly increased its deployment shortly after midnight, and fired many live rounds, gas bombs, concussion grenades and rubber-coated steel bullets at Palestinian protesters. The soldiers also stormed and searched various commercial and residential buildings, car-repair facilities, and many other buildings, in Shweika area. In addition, the army searched under-construction building, various farmlands, and hills surrounding Shweika. Owners of a few of the searched homes have been identified as Ezzeddin Dheiliyya, Salah Dheiliyya, Maher Abu al-Fool, Ahmad Abdul-Jawad, Adnan Ersheid, Yousef Abu Hamed, Mahmoud Iskandar, Adel Hamed, Nizar Hamed, and a coffee shop owned by Amir al-Wahidi. Furthermore, the soldiers invaded and ransacked the home of Hanadi Walid Na’alwa, the sister of Ashraf Na’alwa, who carried out the fatal shooting in Burkan illegal colony, on October 7th 2018, and interrogated her. The soldiers threatened to harm her and her family, and to demolish their home, if they provide any aid to Ashraf, in addition to posting his posters on many homes, walls and doors, threatening to punish any person who helps him. The soldiers also repeatedly abducted members of his family, including his father, mother, sisters and brothers, in an attempt to locate him. On October 15, 2018, the army invaded Shweika area in Tulkarem, and handed Ashraf’s family an official order for the demolition of their home. A US Democratic Party congresswoman described Israel’s nation-state law as “apartheid” at a Palestinian rights event, Mondoweiss reported. Accepting a leadership award at the U.S. Campaign for Palestinian Rights conference on September 30, Rep. Betty McCollum said that Israel’s policies were “brutal” and “cruel” and explained her bill to end U.S. funding for the detention of Palestinian children. McCollum didn’t hold back when describing the law, which defines Israel as the nation-state of the Jewish people. “Friends, the world has a name of that form of government that’s codified in the nation state law, and it’s called apartheid,” she said. Following her speech, USCPR executive director Yousef Munayyer sent an email to supporters praising the congresswoman for using “apartheid” to refer to Israeli policies. “This moment is a benchmark in a narrative shift we have all been working towards for a long time,” Munayyer wrote. The nation-state law has also been condemned by Israel’s liberal parties and mainstream diaspora Jewish groups like the Jewish Federations of North America. McCollum said that she doesn’t see criticizing Israel as an act of anti-Semitism. “Why can’t I hold a foreign government accountable for how they abuse an entire population of people under their control?” she asked the crowd. McCollum, who has represented St. Paul in Congress since 2001, is endorsed by the left-wing Jewish group J Street. Visit the US Capign for Palestinian Rights. The Israeli forces on Monday afternoon have killed Mohammed Abu- Abada, 27 during a protest at the maritime border between the Gaza Strip and the Israeli territories, the Palestinian health ministry in the Gaza Strip said. According to the ministry, Abu-Abada, 27 from the Shatti refugee camp arrived at Al-Shifa Medical Complex with a gunshot wound to his chest. As many as 15 boats flying Palestinian flags attempted to break the naval siege imposed on Gaza Strip. In response, the Israeli forces fired tear gas canisters at the protesters causing dozens of people to suffer from breathing difficulties. In response to the Israeli aggression on the peaceful protesters, a spokesman for Gaza’s National Committee for Breaking the Siege, Bassam Manasra said that “Gaza is still challenging the odds, facing the dangers, fighting for Palestine and confronting the worst forces of evil while paying the lives of its sons a price for dignity”. 140 settlers stormed the Al-Aqsa Mosque on Tuesday, on the side of the Margharba Gate, guarded by Israeli special forces. The settlers carried out provocative “educational tours” of the mosque about the myth of the alleged temple. 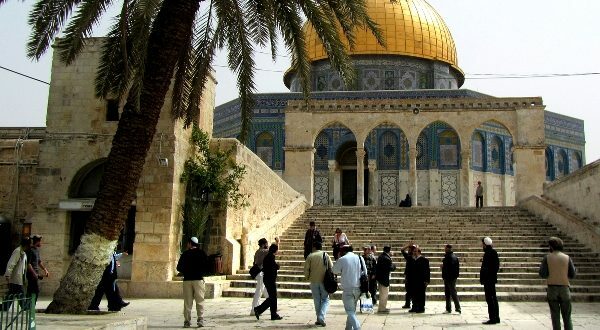 The so-called “organizations of the temple” called on its supporters and the settlers to participate extensively and intensively in the intrusions of Al-Aqsa Mosque this morning, coinciding with the elections of local authorities, under the slogan: (prayer and election is better than serves the idea of building the temple). Dozens of Jewish settlers protested on Monday in front of the Karam Abu- Salem commercial crossing with Gaza Strip and prevented the entry of commercial trucks carrying food and fuel to the besieged Palestinians there. Israel Channel 2 reported that settlers from the Gaza envelope area have been demonstrating since morning in front of the Karam Abu- Salem crossing and closed the roads leading to the crossing. The settlers were protesting against “tensions in (Gaza Strip)” and the Israeli security cabinet’s decision not to respond to the recent security escalation and rocket fire from Gaza. The Gaza envelope settlers have also demonstrated on Sunday in Tel Aviv to protest against the deterioration of the security situation in the settlements and closed some main roads in Tel Aviv. The Israeli Security Cabinet met on Sunday evening to discuss the situation on the border with the Gaza Strip with the participation of senior security and army officials. The Cabinet decided to use the Iron Fist policy on the one hand and give a chance to efforts reach a truce. Israel’s Defence Minister, Avigdor Lieberman said the majority of ministers in Israel’s Security Cabinet are opposed to a “severe blow” against the besieged Gaza Strip. Lieberman added during a meeting of his Yisrael Beiteinu party held Monday afternoon that “there is no way to reach a truce agreement with Hamas without inflicting a severe blow to the Gaza Strip”. The Israeli security cabinet met on Sunday afternoon to discuss the escalation in the Gaza Strip over the weekend and decided to pursue “an iron fist policy on the one hand while giving a chance to the efforts of Egypt and the UN special coordinator the Middle East peace process, Nickolay Mladenov to reach a truce” Israeli media reported. The Israeli forces killed last night three Palestinian children to the east of Khan Younes in the southern besieged Gaza Strip under the pretext of attempting to sabotage the border fence. Earlier on Friday, six Palestinian peaceful demonstrators were killed and dozens were injured during the Marches of Return. Meanwhile, thousands of Israelis from the Gaza envelope area demonstrated on Sunday evening against what they called “the deteriorating security situation” and raised signs reading that “the lives of the envelope residents are not cheaper than the lives of Tel Aviv residents”. A group of Israeli settlers yesterday raided two Palestinian buildings in Hebron’s Old City, in the south of the occupied West Bank, locking them from the inside, Ma’an news agency reported. Reporting the Hebron Rehabilitation Committee, Quds Press said that the homes in the buildings are owned by Palestinian families Arafa, Al-Hamour, Zaheda and Al-Shurbati. The two old houses, Ma’an reported the Committee saying, are adjacent to the illegal settlement complex of Avraham Avino in the heart of the Old City. Today, the settlers enter these buildings and leave them again,” he said. “We are afraid that they will enter these buildings later on and not leave.